Almost six years ago, while working on a story for Business 2.0 magazine, I remember having a conversation with someone from Nokia (s NOK) about the possibility that one day mobile phones could think and adapt to our environment. For instance, what if the phone — using a location beacon — could sense if we were in the office and change the entire profile of the phone based on that information. What if it could turn off the Lady Gaga ringtone when you were at work? 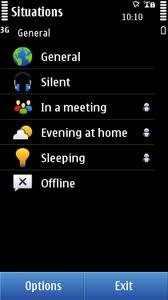 Or read your calendar and see that you were in a meeting and switch to silent mode? At the time, the idea made perfect sense to me. After all, silicon trends were pointing to that future. Early research showed that chips for location-based services would be in every device, just as radios would keep us constantly connected to the Internet. Cheap sensors and cameras would make the phones see and sense the world around us. The phones could use speech technologies to take commands from us, thanks to powerful processors that would eventually power these mobile devices. The concept of the continuous humanization of mobile phones seemed a bit strange then, but now it is a distinct possibility. Change Ringtones, make the phone go silent or louder, turn vibrate on/off, and all the other profile settings. Answer missed calls with SMS. Especially when you set your phone to silent, you can also make it reply to missed calls, from contacts in your phonebook, with a pre-defined SMS. Save Power. Not using phone for a while, like when sleeping? Turn Bluetooth on/off or let your phone change to power-saving mode totally. Change UI theme / Wallpaper. Want to make the phone look different in different situations? Change the Theme during free time vs. when you are at work. I have tried it out on my N8 and I have to say, Nokia is onto something. I don’t want to get too excited – there is a lot of work still to be done and often, we have seen Nokia come up with breakthroughs but not capitalize on them. But this application represents context awareness, which becomes part of the core Nokia experience. Some of Nokia’s other recent applications, such as Nokia Feel and Nokia Bots, all point to a more personal mobile experience and that is what they should use to their advantage. This kind of context awareness is going to become a big deal in the future, mostly because we are entering a world of infinite app options. As the numbers of applications starts to go up on our phones, context awareness could help solve the app-discovery dilemma as well. Most importantly, context awareness would essentially be key to us experiencing the Internet in a more meaningful way on our handsets. I’ve been using Locale for my Nexus One (and now my G2) for this specific purpose – it’s basically the same type of app – it doesn’t really ‘learn’ or ‘think’, but rather reacts to various triggers based on location, situation, etc. The problem that these types of apps have, currently, is the false triggers. Users will expect these apps to work flawlessly, and few people want to give software the chance to ‘learn’ from them. It took me about a month of actively noting my actions/preferences before I got Locale to work exactly how I want it. There are still a few things I need to tinker with, and I’ve been using it for 6 months or so now. Nokia Situations has some serious potential – combined with Nokia Bots (which really did learn from your behaviour) – it can be a real game-changer. Unfortunately, as Om pointed out, Nokia’s awesome at innovating and then not capitalizing on it. For examples, see QR Codes, front-facing cameras, full desktop browsing, app stores, etc. I purchased a utility on my Nokia E71 that allowed me to set up rules like “Silence phone when any calendar event has the word ‘meeting’ in it; back to ringer when event ends”. (I think my Treo could do this, too, with an add-on.) OK, not intelligence per se – very nice, though, and something I wish my iPhone could do. Apple focused on UI responsiveness and simplicity, both very good things. I hope, as hardware gets better and better, we can eventually have the best of both worlds. Maybe a device should not be called a smart phone unless it does things for you. Things like noticing patterns in usage, locations, contacts and calendar events. Warning me when traffic is unusually bad on the commute I do every morning. Automatically downloading podcasts it notices I like to listen to. There are some apps now that change their behavior based on time of day, e.g. Instapaper and TomTom GPS automatically use night mode when it’s nighttime. The umbrellatoday.com app isn’t a phone feature exactly, but it also simplifies my life. I guess it’s a start. I uninstalled the app recently because my phone is crawling with too many services already. I will probably install it again when I get a new phone. Try it out! there are quite a few apps for maemo that do similar things. it will be exciting when meego is released and we can have apps like this too because it will make porting them a breeze. What a great idea. I have been in business meetings or churches and heard phones going in full ringtone mode. You are absolutely on target with this post. Context awareness is progressing rapidly and at Nokia it is one of a number of ways we can deliver more consumer value. Just to be clear, when it comes to connecting the real world with new opportunities enabled by the digital world, my team and others at Nokia are indeed focused to follow through on innovations (our own and those of 3rd party developers) by increasingly integrating Ovi services into the core functionality of our devices. P.S. Nice to see you are using your Nokia N8 birthday gift! I can second the recommendation of Tasker for Android. I have it set up to turn on the GPS when an app needs it, and to turn it off when the app ends. When I leave home it turns off WiFi, and turns it on when I come home. When I turn the phone facedown it triggers silent mode. It takes effort to set up, but does a lot when it’s done properly. I’ve been calling for a phone that thinks for me for years, and it’s good to see this coming down the pike. The hardware is good enough today, and perhaps my conversation with Sanjay Jha will see some work by Motorola. May I just add, technology is only as clever as the people who create it. Clearly this is a starting point and perhaps we will end up at a point where the phones become more self learning and intuitive. That is why I said — Nokia needs to make it their top priority and push the envelope. Yuri states the problem well and is naturally biased towards FB but I think there will be alternative solutions to the problem. The full interview is at http://www.youtube.com/watch?v=YbhXcw5ItmU&p=2737D508F656CCF8 and the above is covered briefly at the end. I have been comparing notes with Jeff Jonas over the past few weeks. He coming from very large data sets, me just doing a lot of theoretical work and some small data. Yet we have the same understanding, which makes me believe we are extremely close to some major break troughs. Since theoretical work shows the same trajectory as very practical work. BTW: one is “mother nature doesn’t do statistics”. Hence Google for example is not on the same trajectory, based on what I have seen in their research they are heavily invested in statistical modeling. Don’t know where you stand, none statistical modeling is a hard pill to swallow for most people. Yes, I know of Jeff Jonas and a truly wonderful person. I/we are of the Bayesian statistical modeling school. Not sure why this would be a hard pill to swallow? Please elaborate. I don’t know what intelligence is. So sorry. addressing scheme, which is important for smart search …) and the building and organization of abstracts. Context is very important in all of this. I could go on for ever. to the abstraction of chars. In other words it scales from a number of pixels to very large data sets. The author either has no clue what context is and how it’s created and processed or he’s doing an incredible good job of concealing it. What he really want’s to do is calculating the information value of any given article for any given person. But for that he needs context which consists of past(memory),present, and future (predictions, goals). My guess, a 12 core personal cluster(2 AMD 6 core, 16G, with 2-4 fast bonded networks and a really big pipe [to Google, somebody got to categorize it first]) will be 100 times better at this than he can ever imagine what’s possible. Tend to agree with Ronald. This appears to be an implementation of ‘situational awareness’. What a lot of us want is a trusted personal advisor that we can ask for suggestions as well to ask what it thinks about something. If the system is continually learning then the suggestions (advice) get better. Intelligent learning systems (also called cognitive systems) for mobile are not far off. It may sound Star Trek’ish but that is where we are heading. At the other end are intelligent systems that are task-oriented and Siri, which Apple acquired a few months ago, is a good example. The technology is very advanced today but thinking phones, I don’t think so. They just do what they are programmed to do. So after reading the entire post i came up with this,i just starred at my Nokia for a while and smiled a bit. I must say that the times have changed a lot,smart phones are getting more smarter than human beings. Nokia with its n8 provided a really cool mobile device,its too feature full but Android is having unlimited apps for smart phones,so people are following the path of Android,nokia must beat it. Great to see Nokia turning into the innovator again. Nokia has this working on Symbian^3. I’d assume they must also be looking at running it on MeeGo as well next year, though the open-source nature of that OS would allow other device makers to grab it. On a side note, I hope the flopped launch of Windows Phone 7 doesn’t shake Nokia’s confidence at bringing out a new mobile OS. Nokia just needs to learn from where Microsoft went wrong, and not repeat those mistakes. This news shows that Nokia still has the ability to innovate. What you describe is just location based categorization. No thinking from the app required, nor context. In a simple case context augments data to make them useful, not required here since it’s pre-defined. So what exactly is exciting here? You can tag times and locations and all kind of stuff. Then you make it interact. Simple filter rule. For lady gaga you need pills and counseling. A smartphone can’t save you. Kevin, there is software for Symbian called GSM Navigator which works similar to Locale but can also work based on the cell sites you are accessing so that it doesn’t drain the battery like GPS does. It can switch profiles, launch applications, send messages based on your location and when you enter/exit a locale. There’s a lot you can do if you find the right app but there is not just one app store for Symbian. There’s an app for this already on Android, it’s called Tasker. It does all of that and more, it’s awesome and the main reason I bought an Android phone. Thanks for the recommendation Malcolm. I am checking this out right now. Tasker on Android is perhaps amongst the top few best applications in the entire mobile ecosystem. Fabulous application that justifies calling Android phone with Tasker as real smartphone! +1 Awesome app and it has been updated quite frequently to my surprise. I use it to actually tell me the time when I want it to, not every 15 minutes or 30 minutes (and it works unlike many clock/alarm apps) You can set volume settings according to date or time or when you click on a widget. I have also made personalized slide shows that run at the click of a widget, or you can make your own soundboard of sorts (sounds at the click of a widget) You can also do this according to location, I haven’t because of battery sucking GPS. Wow, this looks to me as a very sensible and great app. The first time that I run into something that my iPhone cannot do. Is so interesting to see the way the tecnology is turning and especially be part of this.